This was a big, big week. There are a lot of pictures. With the timeline ticking on getting the fermentors, I had to finish the floor preparations. 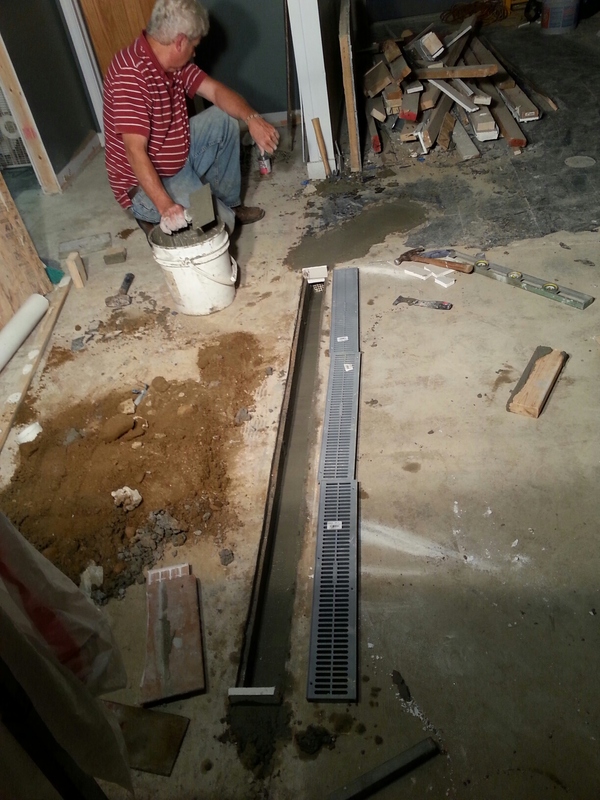 I decided to put in a trench drain. I wasn’t going to, especially at the 3.5 bbl size, but I had the perfect place to do it. From working at home in my pilot brewery on fermentors with the same fittings and geometry as I will be getting, and doing several iterations of fermenting, cleaning in them, I know what spills I make and of how much. I don’t spill a lot. If anything, all I need is a mop to clean up my messes. 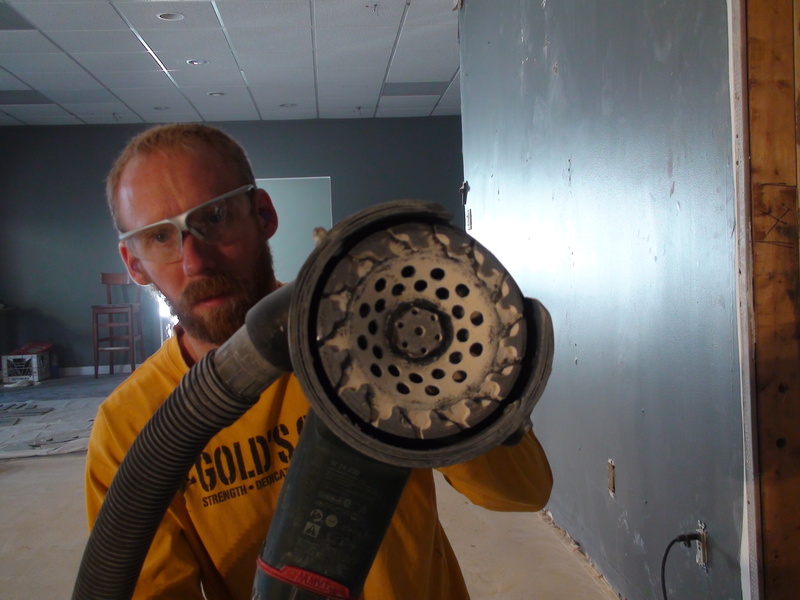 If you are careful enough with your piping and hoses, messes are minimal. 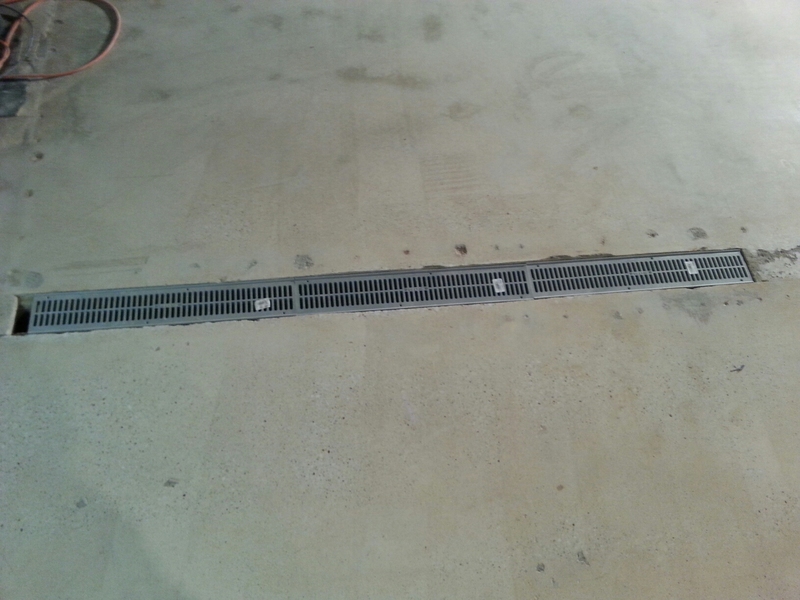 But a trench drain will make it a lot more convenient for washing things down and squegeeing any liquid towards the drain. Plus in case there IS ever an issue with a bigger spill, it will take care of it. 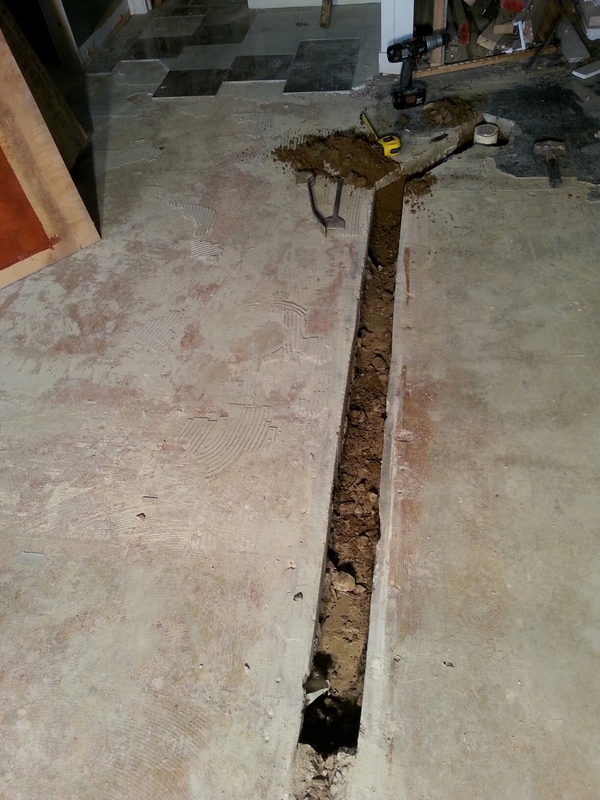 So I decided to put the trench drain in the four inch space between building foundations. For whatever reason, the two addresses I rented are two different concrete pads with some ‘junk’ concrete poured in between them that I would have had to fix anyway to make a continuous floor. 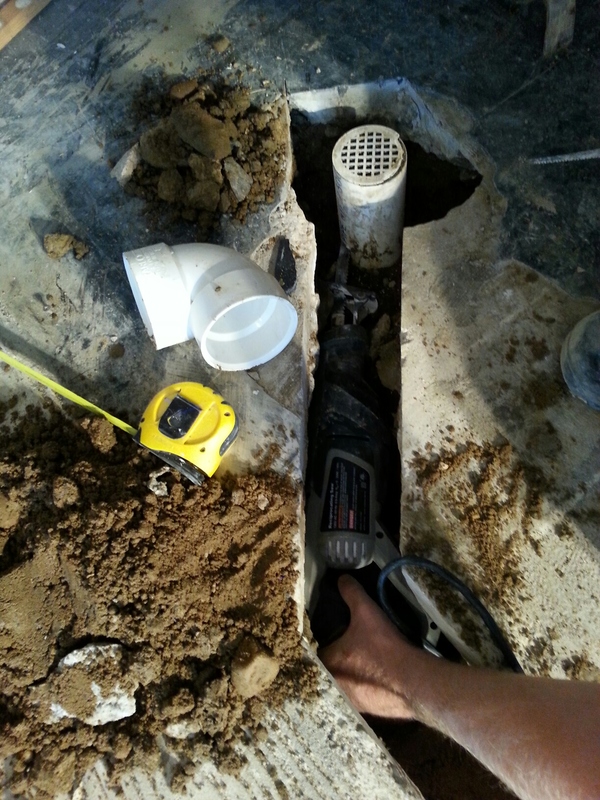 With a floor drain only two feet away, I decided to ‘fix’ the existing floor drain to become a more effective trench drain. 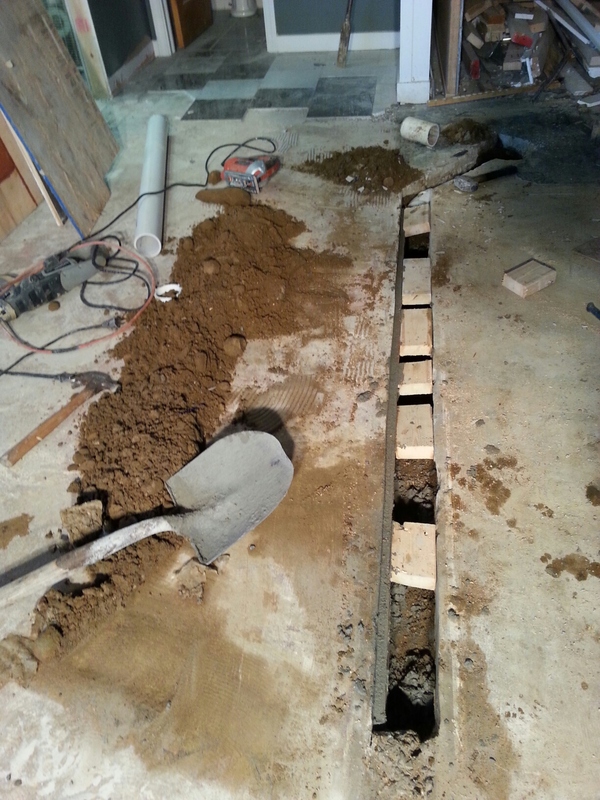 This is the future trench drain…in the middle of two building foundations where somebody poured some ‘slag’ concrete. About four inches, it was the perfect width. I was going to use a gas-powered Stihl saw with a metal/masonry blade on it…inside…I wasn’t looking forward to the fumes, the mess and the inability to cut a perfect line…but then I remembered I had a diamond tile saw blade that fit my circular saw perfectly. All John did was keep a spray of water on it and it cut like butter with NO DUST. 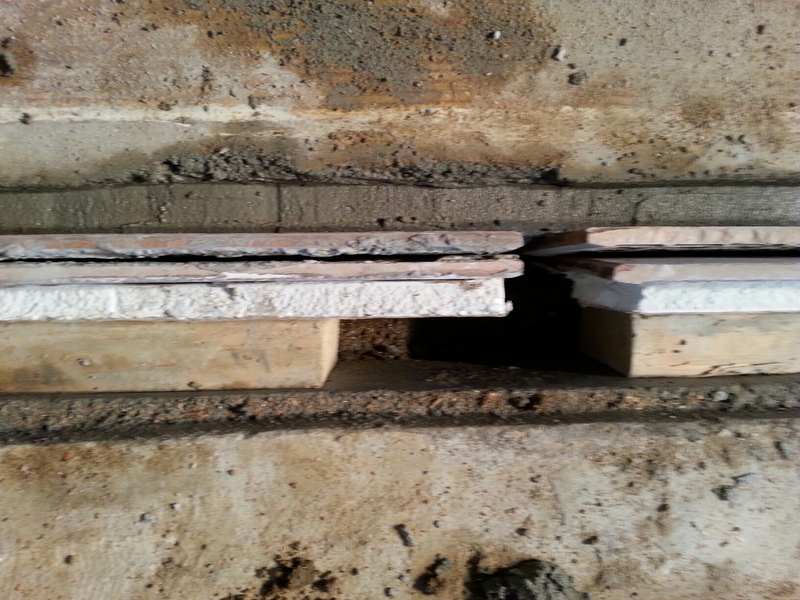 *Note, we knew that this concrete was in between two building and from some initial chipping, we knew no utilities were there. 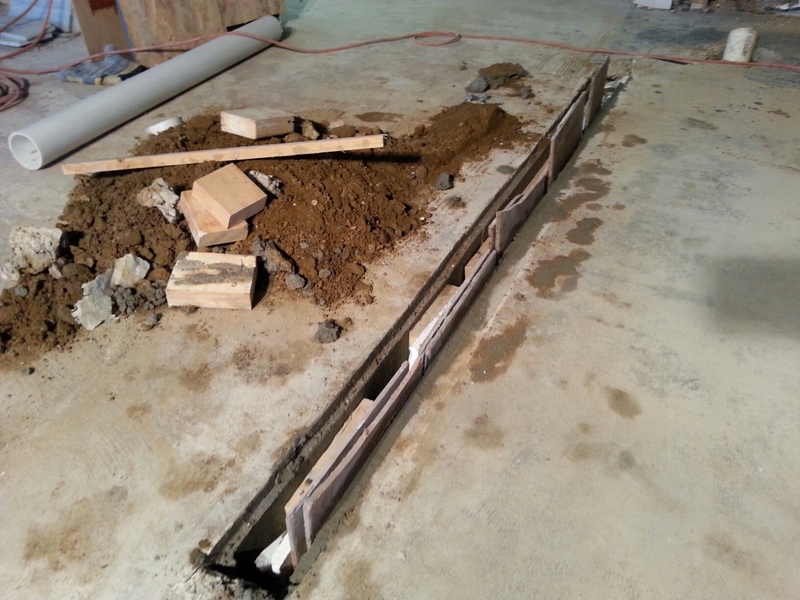 Please make sure you know where all utilities are before cutting into foundation concrete. 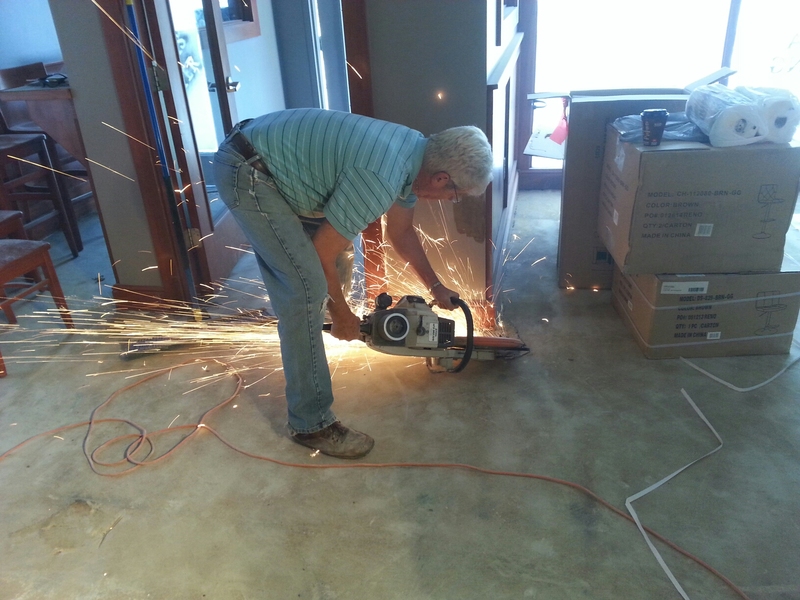 John saves the day with the jackhammer. That thing has come in handy more than once down here. 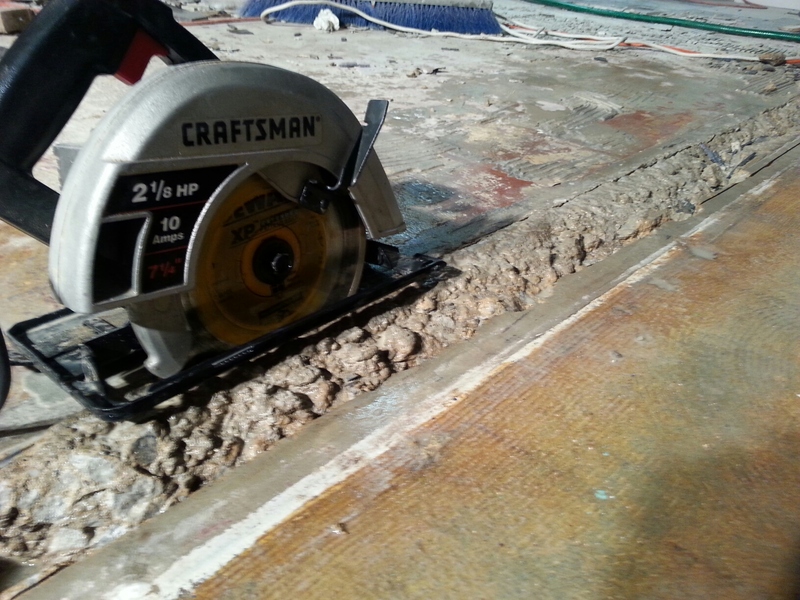 Cutting into the convenient, but utterly useless floor drain. I’m making a better floor drain. 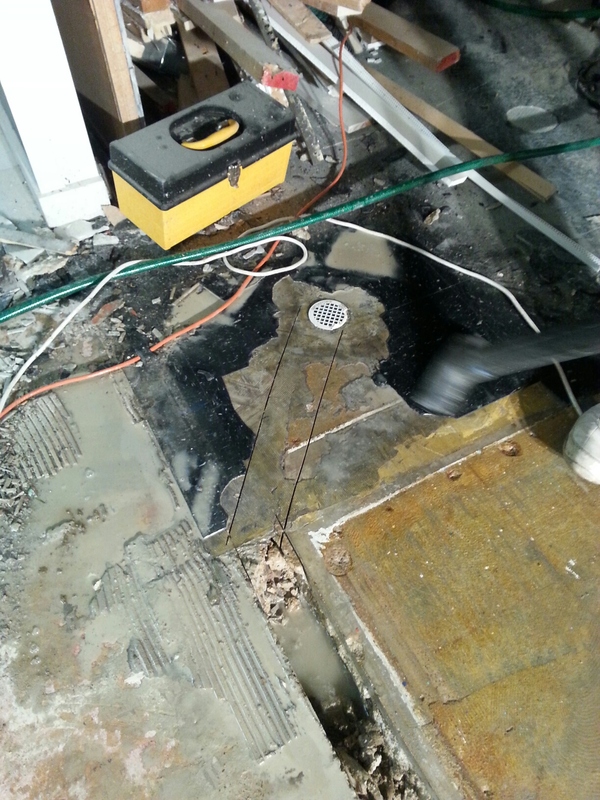 Trying to cut the existing drain to tap into was interesting. Probably a gross overestimation of needed concrete. 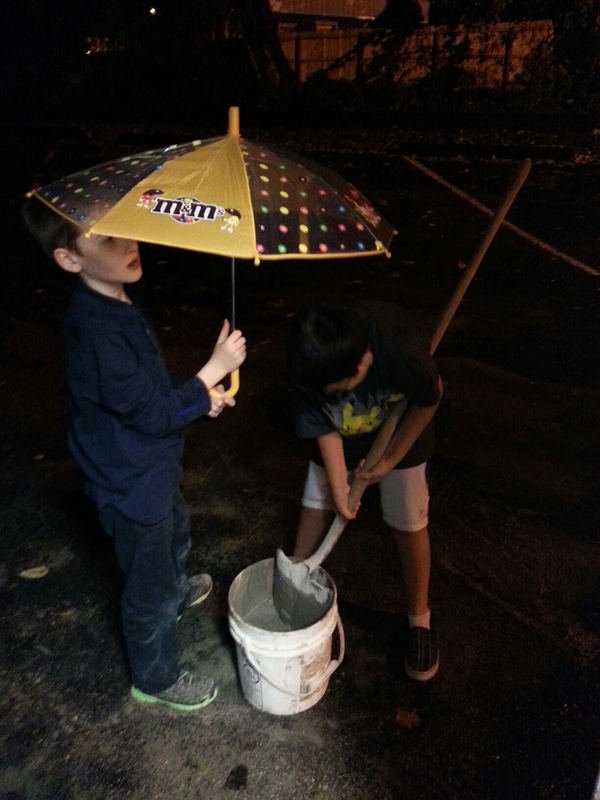 Trev and Dev mixing concrete in the drizzle. 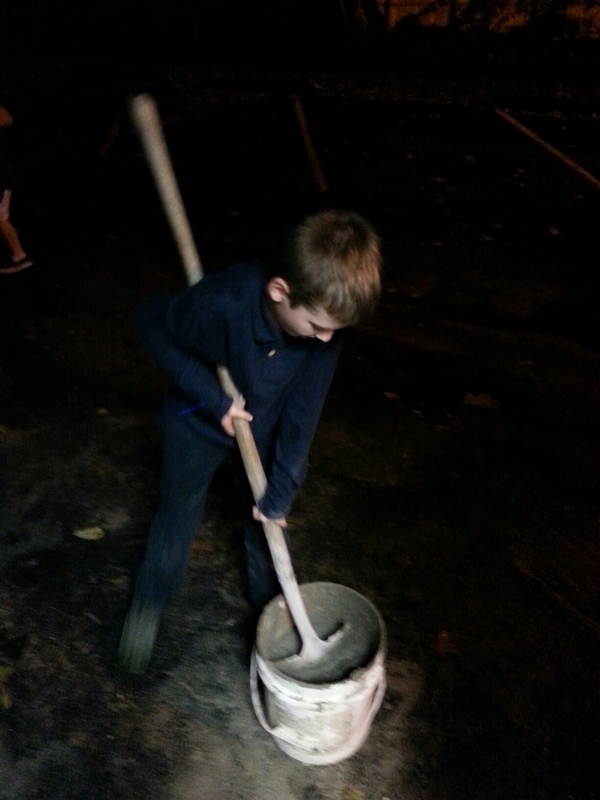 The actually did all the mixing themselves and did a great job. Building a form for the first wall. I ended up dumping the concrete in then sandwiching the wall up. The second wall being made. Close up of the ‘form’ for the walls. It ended up being whatever material laying around to get the spacer width needed. 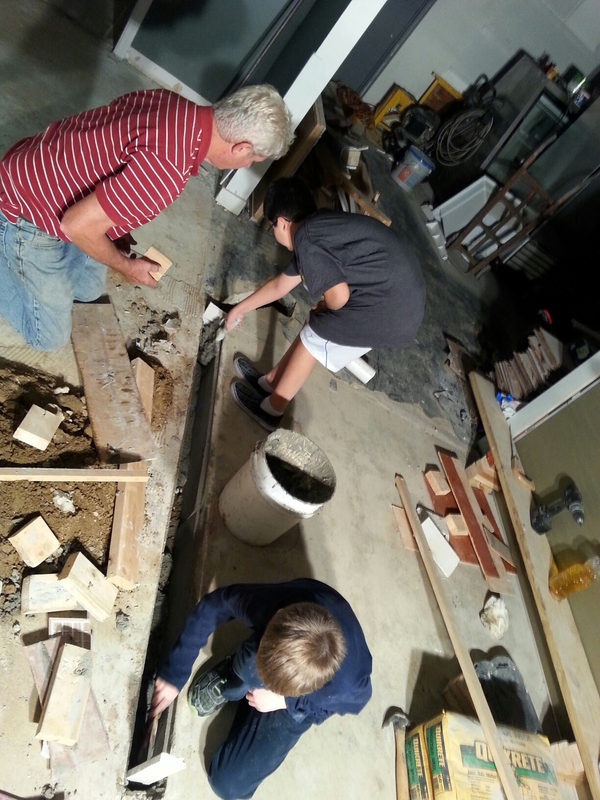 Dad and kids working on the floor of the trench drain. There it is! All done. They truly did a lot of work on this. 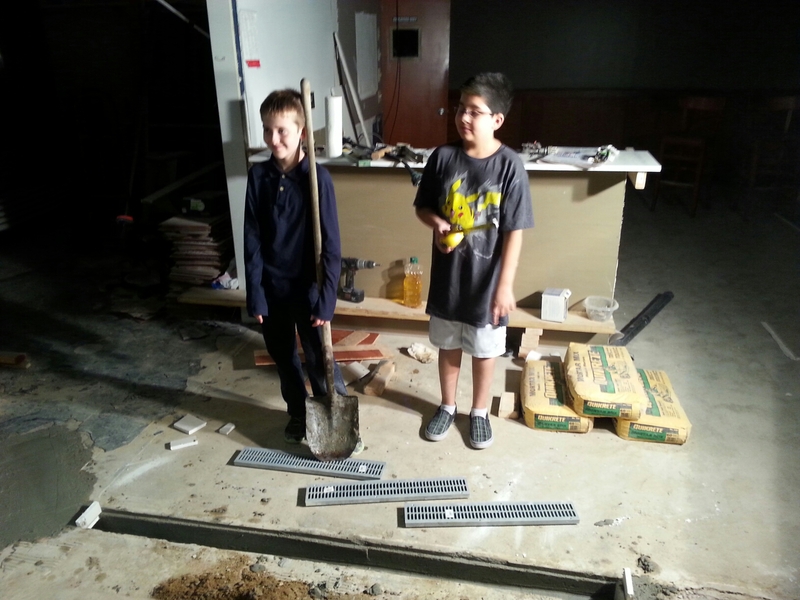 They may not appreciate this now, but they are probably the only kids in their school that knows how to mix concrete and pour forms. 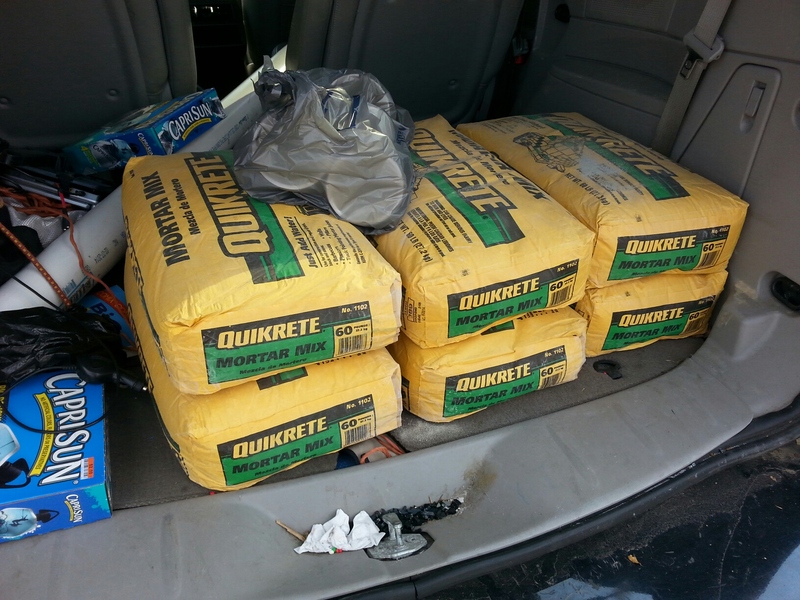 With the trench drain done, it was time to rent some concrete smoothing/grinding equipment one more time. 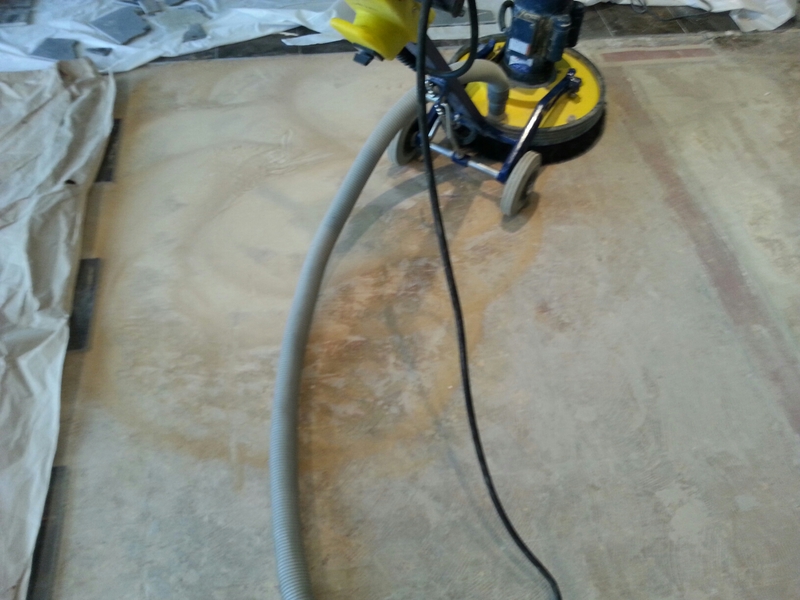 I had to get the adhesive off of the floor that my wife lifted the marble tiles from. See the difference? 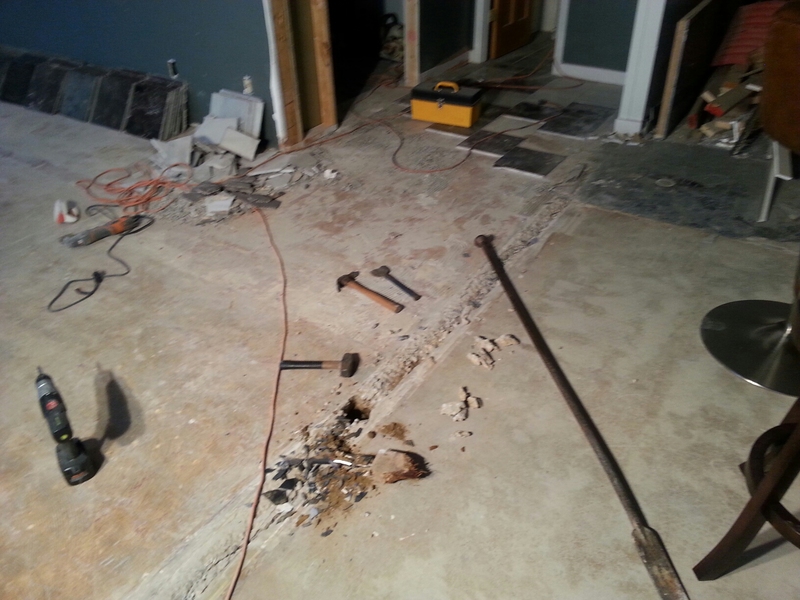 Top left corner is the nice concrete floor, the rest had lots of glue and paper from prior floors that need removed. Devin actually took a few turns on this. 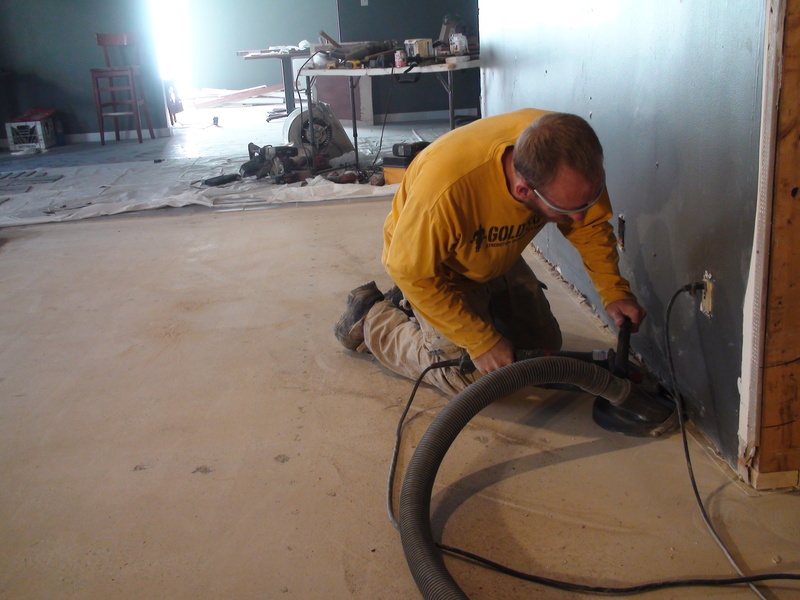 This is another cool concrete grinder that will get edges. It really tears through concrete so you need a light, steady hand. 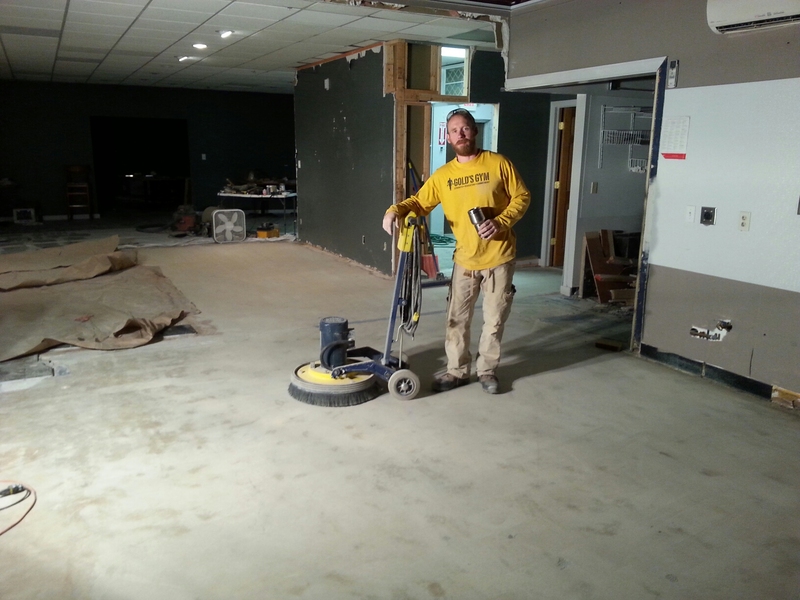 The finished floors that will be behind the bar. 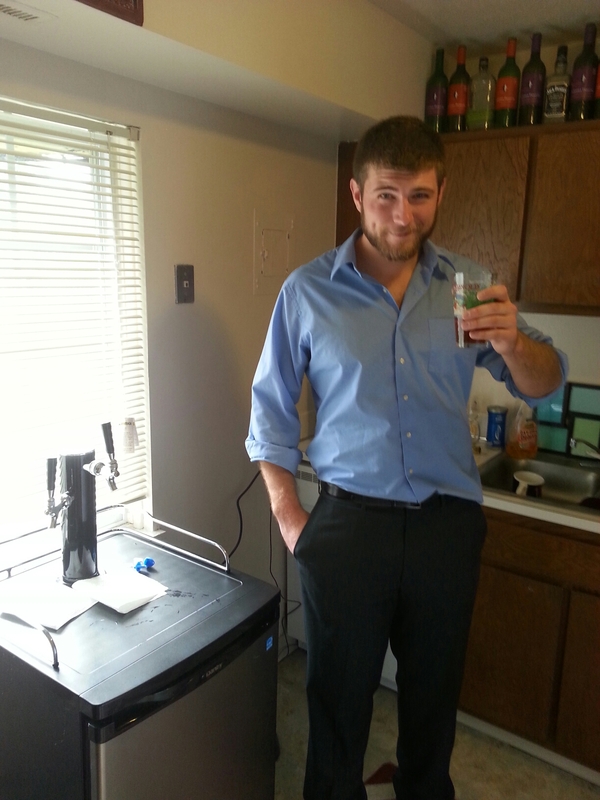 We also took a trip to install a kegerator with an additional tap. It will give assistant brewer Jesse some experience with that side of things – the fittings, pressure, troubleshooting and getting the perfect pour. Poured perfect the first time! No excess foam. 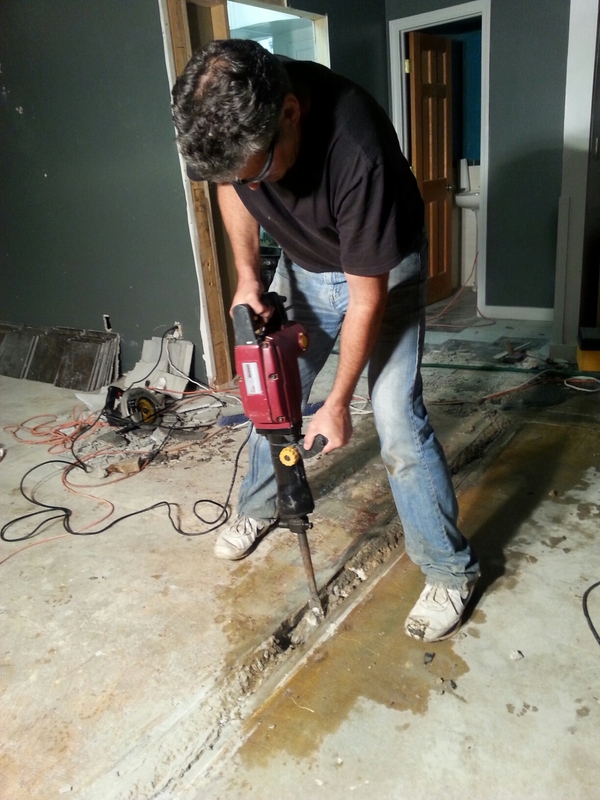 Start moving in other equipment to make sure it ‘spatially works’ before building the bar and coldroom. John for initial trench cutting and brainstorming. 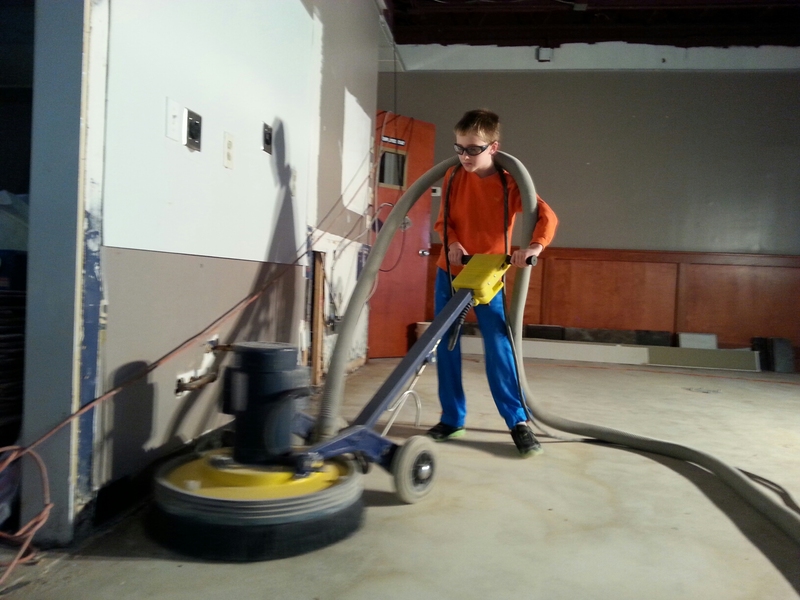 My dad for work on the drain and floor polishing and my kids for their hard work. My kids are learning a lot and I hope that they can take away and use what they are learning some day. 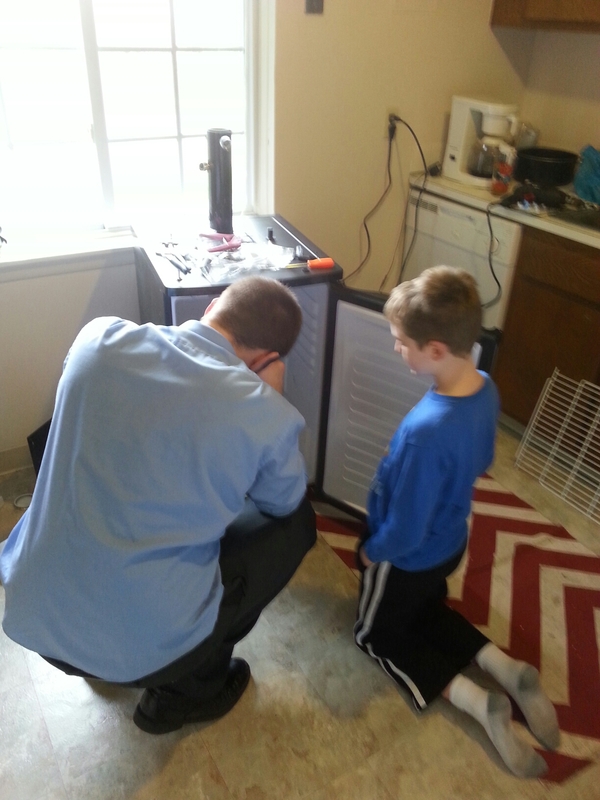 In a day where it’s all bookwork and homework, there is little time for kids to get ‘hands-on’ and involved with a business or trade. I feel this is equally as important as homework as there is high demand for trades like this (masonry, welding, etc) where you can make nice money immediately without a boat-load of student loan debt. Plus just building something with your own hands is priceless. 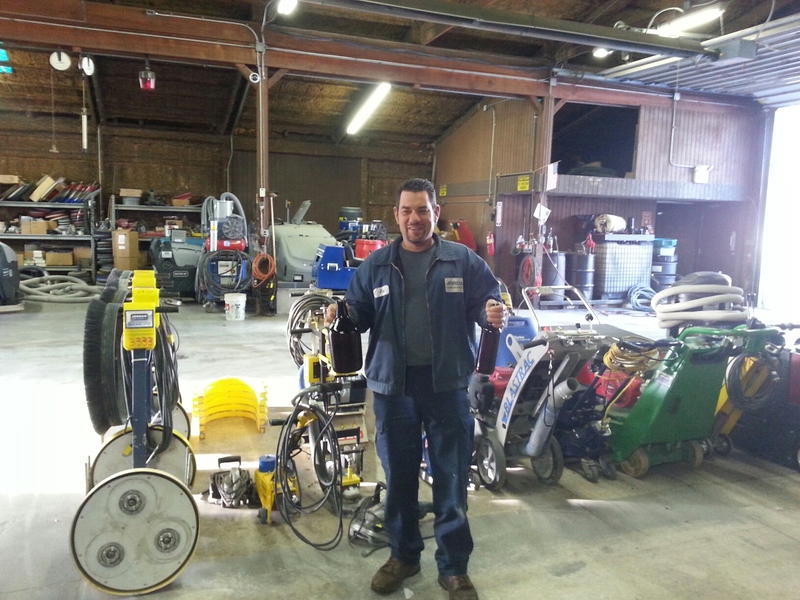 The guys and gals at Jordan Power Equipment Rental. They came through again getting me what I needed, when I needed it.